Dr. Martha Livingston (Rachel Borwein) is a court-appointed psychiatrist sent to evaluate Sister Agnes (Kathleen Thomas), a young nun whose infant has been found strangled. 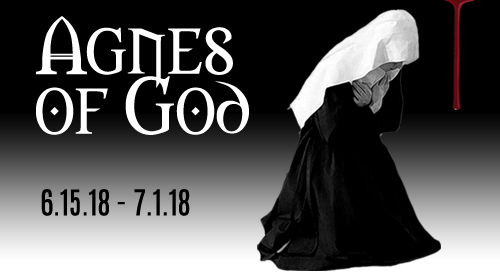 With Agnes claiming a virgin conception and having no memory of giving birth, Livingston must distinguish between the lies and the nun's perception-altering faith. Complicating her investigation, Livingston continually clashes with the overbearing Mother Miriam Ruth (Mary Jane Disco) , who insists that Livingston leave Agnes alone. The Studio Players was founded in 2011 by Scott Lilly & Kevin Moriarty to provide a highly creative environment in which professional artists and artists in training are encouraged and welcomed to broaden their craft through new and established works. We're seeking to explore more alternative and contemporary plays along with more established pieces. A theater is nothing without its actors, directors, backstage crew, set designers, set builders, hospitality / volunteers and its patrons. The Studio Players holds open auditions for its plays, and welcomes assistance backstage on props and lighting and front of house hospitality. Copyright @ The Studio Players, Inc. All rights reserved.